Auggie and Me: This is the second book written by R. J. Palacio after ‘Wonder’. For those of you who haven’t read her earlier book, it talks about the difficulties in the life of a boy named Auggie Pullman who has a physically deformed face and bad health. ‘Auggie and Me’, is related to Wonder, but it doesn’t talk about Auggie. It talks about the people in Auggie’s life. These two books made me read ‘The curious incident of the dog in the night time’, as all three talk about boys who have some problems with social interaction but are extremely talented and unique when you get to know them. It is like their backstory, sharing a little bit of what it was like before they met Auggie, and their experience with him. 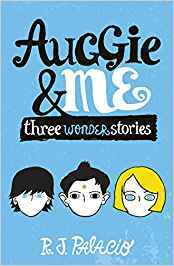 There are three stories in it – one from Julian’s perspective (a boy who bullied Auggie), Christopher (Auggie’s earlier friend) and Charlotte (a girl who is kind to Auggie). Avishi and Abhaya are two historical fictions written by Sai Swaroopa Iyer. After reading them, I started enjoying historical fictions and was thirsting for more. That was when my father gave me The Brahmin written by Ravi Shankar Etteth. It is a murder mystery set in the time of King Ashoka. When one of King Ashoka’s concumbines is murdered, the eponymous Brahmin, the head of the spies working under Ashoka, is sent to investigate. On reaching the murder site, he finds a red kovidara flower next to the body, which indicates that the dangerous assassin, famously known as the Red Flower is on the loose and is here to kill the king. When he informs the King about this, he is given seven days in which to find and capture the killer. 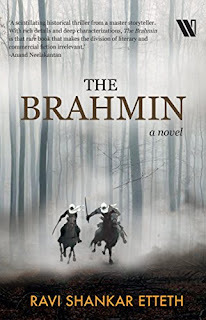 The Brahmin along with his trusted lieutenant Hao decide to go to Ujjain, the residence of Queen Asandhimitra, as the war strategy plans are stored there. He stumbles upon sinister plots and his cunning is put to test when there is a chance that Queen Asandhimitra’s life is in danger too. How will he save Magadha when the enemy is always two steps ahead of him?